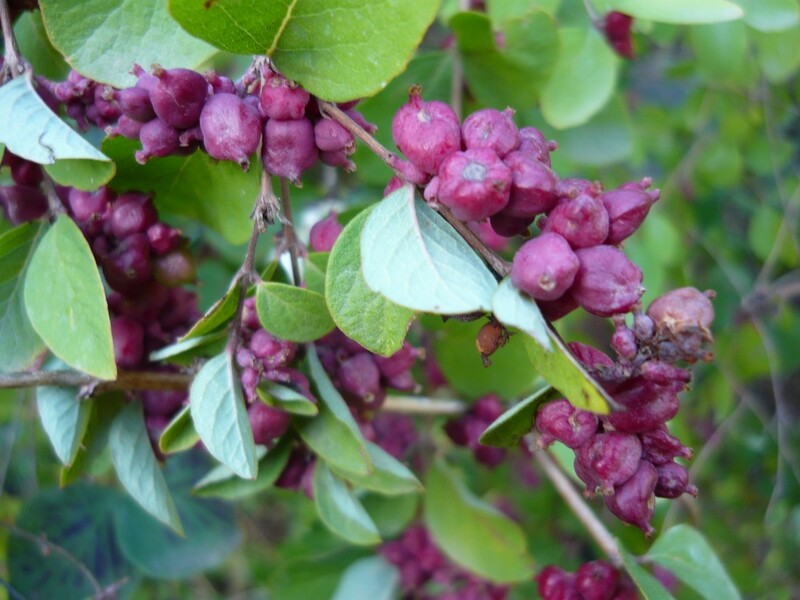 Symphoricarpos orbiculatus is a shrub to 2 m tall, branching opposite, twigs thin, hairy, gray-brown, older stems with shreddy bark, pith brownish, continuous, base of twigs with small overlapping scales. Leaves opposite oval to egg-shaped, dull dark bluish green above, pale waxy green, hairy below, 2-4 cm, blunt at both ends. Flowers small, bell-shaped, to 0.4 cm, stalkless, greenish and purplish, calyx very short; inflorescence of dense upper axillary clusters; blooms June-Aug.
Fruit fleshy, red to purplish, beaked by old calyx, to 0.7cm long, 0.5 cm wide, with smaller, sterile fruit of various sizes in a cluster, persistent into winter, bird dispersed. Origin: Native to PA and south. Habitat: Escaped from cultivation or naturalized, edges of woods. Moderately shade and drought tolerant, soil pH 5.5-7.5, tolerant of fire (USDA, NRCS 2010).